Definition at line 40 of file llfloaterhtml.h. Definition at line 96 of file llfloaterhtml.cpp. References gSavedSettings, LLView::mRect, LLControlGroup::setRect(), and sInstance. Definition at line 57 of file llfloaterhtml.cpp. References LLUICtrlFactory::buildFloater(), LLPanel::childSetAction(), LLPanel::childSetCommitCallback(), FALSE, LLRectBase< Type >::getHeight(), LLControlGroup::getRect(), LLViewerUICtrlFactory::getWebBrowserByName(), LLRectBase< Type >::getWidth(), gSavedSettings, gUICtrlFactory, onClickBack(), onClickClose(), onClickForward(), onClickGo(), onClickHome(), onCommitUrlEdit(), LLView::reshape(), and LLView::setRect(). 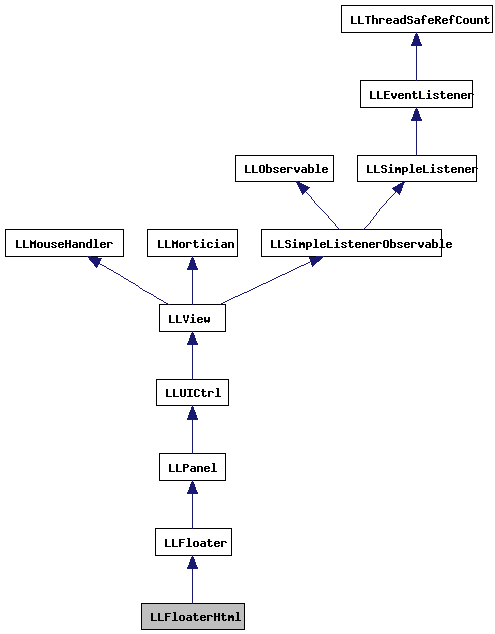 Definition at line 106 of file llfloaterhtml.cpp. Definition at line 47 of file llfloaterhtml.cpp. Referenced by handle_slurl_test(), and LLShowFloater::handleEvent(). Definition at line 171 of file llfloaterhtml.cpp. Definition at line 162 of file llfloaterhtml.cpp. 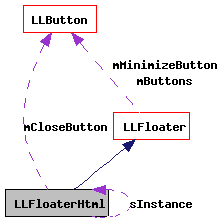 Definition at line 212 of file llfloaterhtml.cpp. Definition at line 245 of file llfloaterhtml.cpp. Definition at line 187 of file llfloaterhtml.cpp. Definition at line 155 of file llfloaterhtml.cpp. Definition at line 228 of file llfloaterhtml.cpp. Definition at line 138 of file llfloaterhtml.cpp. Definition at line 125 of file llfloaterhtml.cpp. Definition at line 69 of file llfloaterhtml.h. Definition at line 68 of file llfloaterhtml.h. Referenced by getInstance(), and ~LLFloaterHtml().